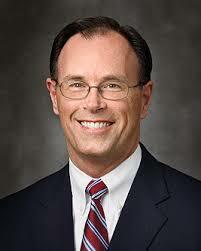 Wayne Christopher Waddell is a general authority of The Church of Jesus Christ of Latter-day Saints. He was sustained a member of the First Quorum of the Seventy on April 2, 2011. He was serving as a member of the Fifth Quorum of the Seventy at the time of his call. As a young man, he served as a full-time missionary in Barcelona Spain Mission and returned to that mission in 2006 to serve as president. He has also served in the Church as bishop, high councilor, stake president, and Area Seventy. Waddell was born on June 28, 1959, in Los Angeles, California. He attended San Diego State University on a volleyball scholarship, where he earned his bachelor’s degree in history in 1984. He was an All-American player his last year at the university and played in the World Club championship tournament in Argentina in 1983. He went to work for Merrill Lynch in 1984 where he served in various responsibilities, including first vice president of investments. He also did graduate work in the executive MBA program at Brigham Young University. Waddell married Carol Stansel in 1984 and they are the parents of four children.